What happens when a million heads collide? A Perthadelic mind-splurge, that’s what. To simplify matters, let’s start with just two: Kevin Parker and Nick Allbrook, Tame Impala’s singer and ex-bassist respectively, and the two biggest heads in the burgeoning Perth psych scene. Whenever Parker was locked away to single-handedly pull Tame’s albums out of God’s nostril, Allbrook was busy with his own astral pop projections. Jamming randomly with other at-loose-ends Tame members (and occasionally Kevin too, on drums), he built a sprawling collective around Pond, the improvisational art-rock collaboration that was formed on the day of their first house-party gig in 2008, and knocked up their 2009 debut album ‘Psychedelic Mango’ on an eight-track in Nick’s parents’ granny flat. 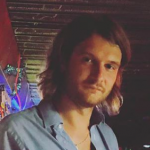 After three more albums (see box, right), and with all the sounds in his head colliding with the fucked-Floyd freak-outs of ‘Lonerism’ on tour, Nick left Tame in May to concentrate on Pond, among other projects. Bizarrely, he was replaced in Tame by Pond drummer Cam Avery, who clearly never got the ‘Leaving Tame Impala To Concentrate On Pond’ memo. Now, you’ve gotta have the self-belief of a Scottish Wimbledon champion to quit the coolest band in the world to go make a seven-track album of surreal psychedelic blues about spiritualism, giant tortoises, conspiracy theorists and Pegasus. But that’s what Allbrook has done, and with considerable success. Pond’s fifth album, ‘Hobo Rocket’, bristles with unrestrained creativity and sonic exploration, while verging away from pastoral prog towards a harder garage blues slant. Spiritualist acid mania infects ‘Hobo Rocket’ from its first mystical inklings: opener ‘Whatever Happened To The Million Head Collide?’ wafts in on a cloud of MGMT and a distorted Buddy Holly bass riff, Nick emitting psychedelic yowls between references to “the holiest of holies’’ and how “I am, you are Buddha, Krishna, God’’. Then he screams, and the track becomes a White Stripes/Band Of Skulls voodoo rocker, Nick shifting from meditative peacenik to paranoid conspiracy freak: “I’m gonna sleep for a week and not speak at all/Cover myself in oil and tin foil’’. It’s a schizophrenic mash-up, but one hell of a sucker-punch opening. Heavy as a narwhal’s balls and concerning the crippling emotional effects of psychoactive medication, the brittle blues bluster of ‘Xanman’ provides pop relief in the style of a wormhole ‘Seven Nation Army’, Nick playing the lusty funk squealer with commitment during the blow-out coda. ‘O Dharma’ – by turns The Beatles’ ‘Sun King’, Pink Floyd’s ‘Any Colour You Like’ and Hot Chip getting groovy round the Maharaja’s gaff – is perhaps the sweetest acoustic gospel-hippy swirl ever to centre around the phrase “And if you muthafuckers don’t like it you can all get out’’. It’s a key phrase to Pond’s ethos; reflecting their experimental roots – and perhaps Nick’s wild musical mood swings – this is an album of dichotomies, both thematic and sonic. Lulled into a pleasant dopamine haze by ‘O Dharma’? Now take the ponderous, misanthropic Zep-metal chunder of ‘Aloneaflamaflower’, segueing into ‘Giant Tortoise’ – a tune that imagines Jack White going back in time to guest on ‘Across The Universe’. Pond’s open-mindedness lifts off towards event status on the title track, in which a guy called Cowboy John – a local legend described in the sleevenotes as “artist, mystic, wanderer, eccentric’’ – rants and mumbles about flying through the universe at “twice the speed of light’’ on a “horse with wings’’ like a dope-fried Lou Reed, then starts asking the band mid-song what drugs they’ve got. It all wraps up with the demonic blues metal of ‘Midnight Mass (At The Market St Payphone)’, complete with a pastoral, Floyd-y, four-minute ‘Dear Prudence’ outro to a record that leaves you mentally a-quiver. When a million heads collide, it seems, it’s a colourstorm.